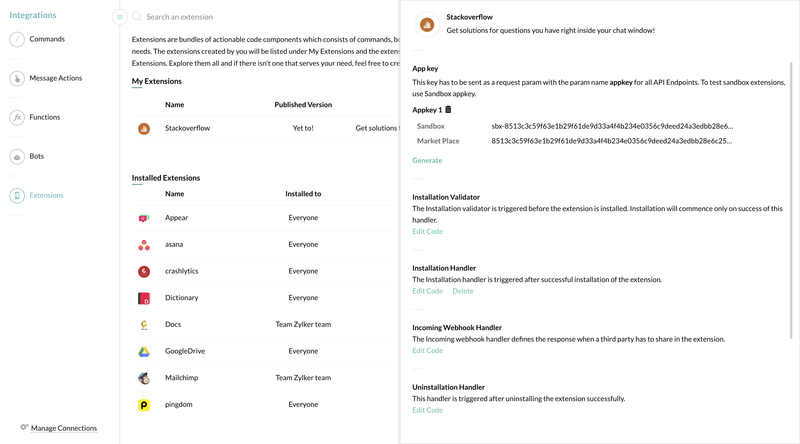 Extensions are bundles of practicable code integrations; containing commands, bots, message actions, functions, channels combined together to suit your client or user requirements. Extensions created by you are listed under the My Extensions section. The extensions installed from Zoho Marketplace are listed under the Installed Extensions section. How to build an extension? First, create the commands, bots, message actions, functions you would like to bundle together as an extension. These components are the building blocks of your extension, refer internal tools to know more about how to create them. Once you have all the above mentioned components ready, you can create your extension. Click Create Extension and give your extension a name, description, image and select the commands, bots, message actions, functions and channels. A maximum of 4 integration components from each section can be added in an extension. Once you have selected the components to be included, select the Create button to get the first version of your extension ready. Simultaneously a sandbox version of your extension will be installed along with the extension components (internal tools). The sandbox version of your extension should be used for developing extension upgrades and publishing them. This extension will be listed under the My Extensions section. You can either Publish or Edit it further. It is not mandatory for an extension to have all the above-mentioned components. You can have an extension containing only a single component (commands, bots, message actions, functions, channels) or bundle each component together as an extension. A sandbox extension is just a production replica of your extension. 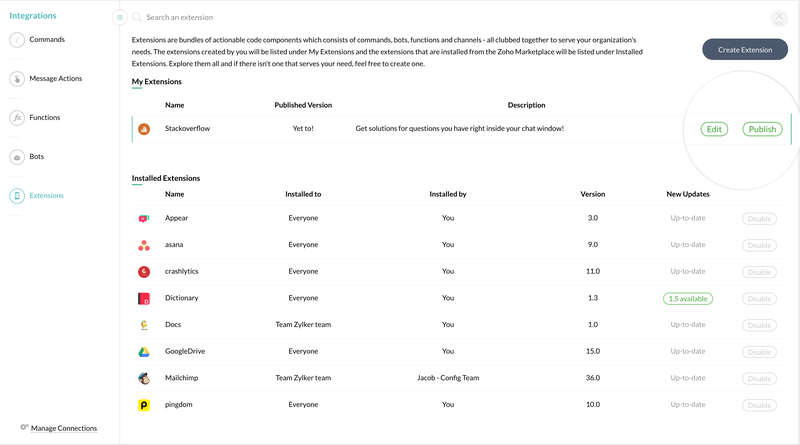 The extensions created and listed under the My Extensions sections are the sandbox versions. This allows you to test the extension for issues before proceeding to publish in the marketplace. Once an extension is created, all the components bundled in the extension will also have a sanbox version created and listed under their respective sections. 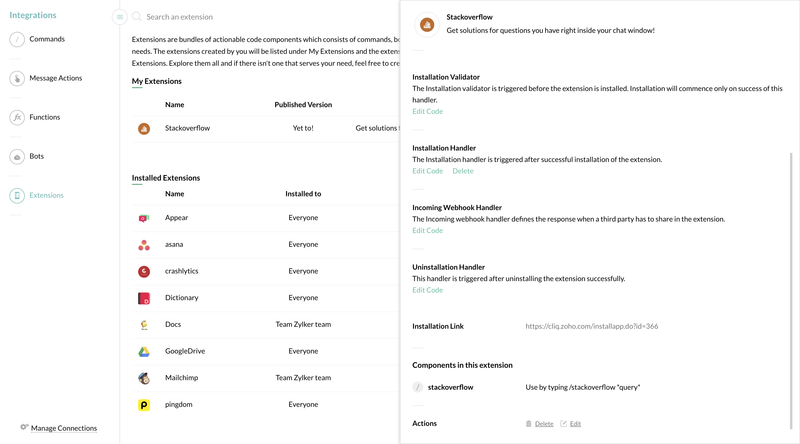 To publish an upgrade to your extension, you will have to edit the code present in the component's sandbox version. For example, the Asana extension can have a @Asana bot and an /asana command. Upon creating the extension, sandbox versions of the @Asana bot and /asana command are created. Any changes in the bot or command's functionality will have to be made in this sandbox version of the command and bot and can be pushed live as an upgrade. Extension connectors are basically components that play a major role in authenticating and integrating your extension with the third party service. The App key is a unique identifier for your extension and is mandatory for authentication. This key has to be sent as a request parameter with the param name appkey for all endpoints. Each extension is provided with two app keys, the Sandbox App key and the Marketplace App key by default. App keys are like a token for your extensions and must be used in all API endpoints. The sandbox app key can be used while testing the extension in the sandbox environment. You can also generate a new set of App keys by clicking the Generate option. A maximum of only 3 App Keys can be generated at any given point of time. Only extensions created by you can be edited. To edit an extension, click Edit by hovering over then extension name. Cliq permits you to change the extension name, description, image and even alter the components you would like to bundle. Just unchecking a previously added component will remove it from the extension bundle. Once an extension is published, the extension name cannot be edited. Only the extension description, image, and the components can be edited. Editing an extension after it is published will not make changes to the published extension in the marketplace. Delete an extension by clicking on the extension name. The extension preview page has the 'Delete' extension button at the bottom. Note that deleting will not delete the extension from the marketplace.